Garlic, in my opinion, is by far the easiest thing to grow. 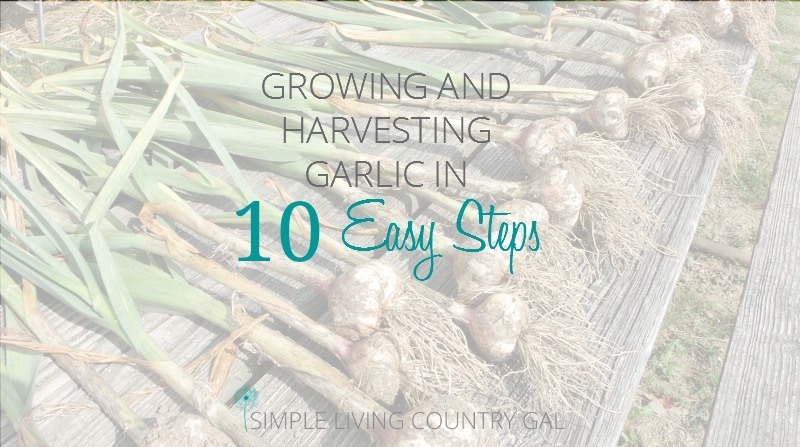 So simple in fact, you can grow garlic in 10 steps. It requires very little attention, rarely fails and is simple to preserve for use the whole year. It is perfect for me because of it’s “plant it and forget about it” qualities. If you are new to garlic then you’ve come to the right place. If you are new to gardening, then garlic is the perfect way to get your feet wet. If you are new to canning? I gotcha covered! I am going to break things down so it’s super easy and yes…fun too! How to grow garlic in 10 easy steps. In colder climates like Northwestern PA where I live, the most important thing to remember about garlic is that it needs to be planted in the fall. I even planted as late as November once and they still did wonderfully. Just watch your frost dates and try to plant a few weeks before your first frost. For my southern friends, I do believe February/March is the best time for you to plant. We eat a lot of garlic and I give it away as gifts for the holidays (which people love!) so I like quite a bit. I usually plant about 6-7 heads. Each head can be broken into about 10 cloves so remember each clove you plant will give you a head of about 10 cloves. My first year I planted 10 heads worth of cloves…ha, do the math! I was up to my neck in garlic!! I like to plant a 4 x 8-foot bed of garlic and I can fit quite a few heads in there. They don’t need a ton of room just plant about 4″ apart and about 2″ deep. Make sure you have nice seed garlic, garlic from a farmers market or your own homegrown. A good tip is to break up the heads a few days before you plant and let them sit. Keep the skins on. When it is time to plant, place them in the ground with the root end facing down and cover with soil. I am sure there is a more technical term for this, but I like hibernation. 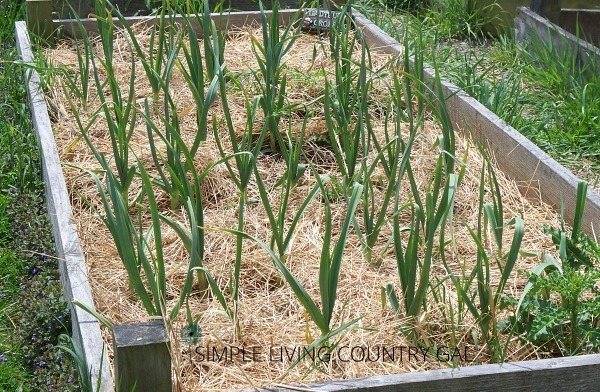 I cover my garlic with a heavy layer of hay or straw that is leftover from the barn. After that I place a layer of protection down, usually, a piece of fencing works fine. 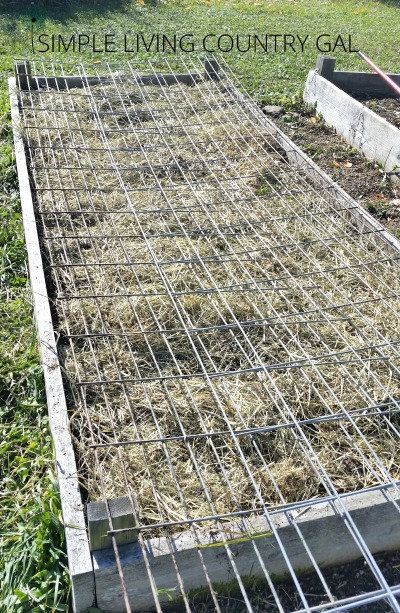 This works in two ways, it keeps my chickens deterred and keeps the hay from blowing away. I let that fencing sit all winter and only remove in the spring. Step #5. Don’t do a thing until spring! I don’t even water mine, I just let it sit. Then comes spring you will see green shoots emerging from the ground. That is a wonderful site for sure. At this point, you may want to remove some of the mulch if you used quite a bit, but make sure your cold weather is done before you do this. \I like to leave some of the mulch down to deter weeds. Now is when you need to pay attention. Water as needed, weed when necessary and remove the fencing when the stalks are large enough that animals will leave them alone. 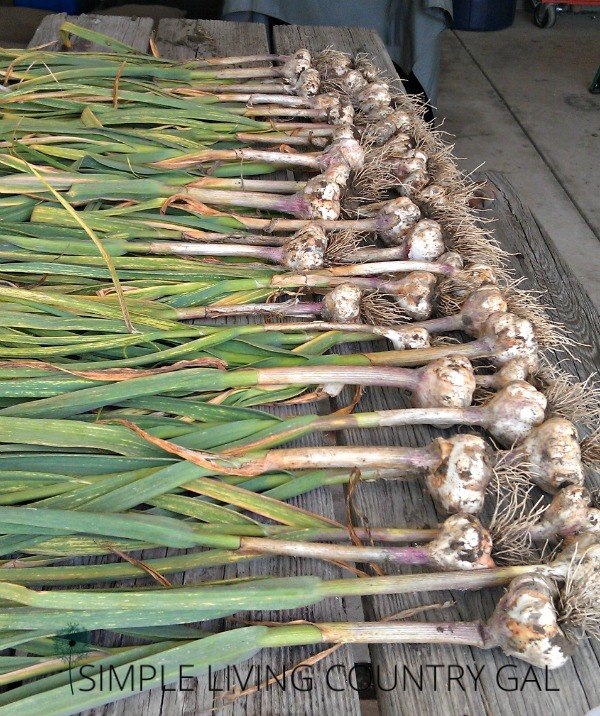 Depending on what type of garlic you plant will determine your harvest time. When they start to turn brown and droop its time. I will dig one up to see if it’s ready, if so the rest come up as well, if not I will wait a week or so and try again. Note…garlic does not like to come up easy so don’t think you can just pull them out, they must be dug up with a shovel. Be prepared for a good workout! Also, it is important to place your shovel well out from the head. If you dig in too close you will slice the head and loose some of your cloves. Always go deeper than you think necessary and you should be fine. I dry my garlic in two steps. First I lay it out in a single layer in a dry place outside, but not in direct sunlight. After a few days to a week, it is time to shake off the excess dirt. 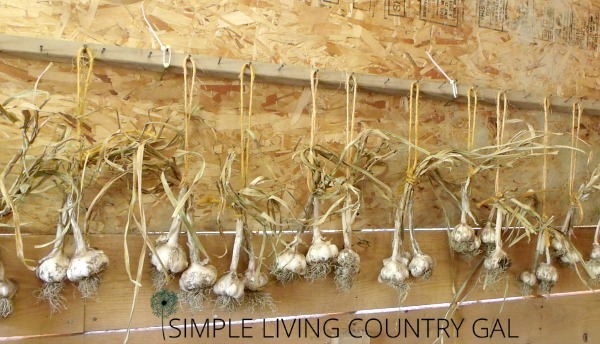 Gather your garlic in clumps of 3’s and 4’s to hang in a place with good air circulation. I like to hang mine in the barn. The barn smells like an Italian restaurant! Let them remain hanging for a good week or two. Read my post on How To Cure Garlic for more details. Once the garlic is completely dried it’s time to get them ready for use. I cut the stalks off close to the head, remove the outer layers of husk leaving a few papers on to keep them protected and fresh. I also cut the roots off completely and store them in cloth bags or orange mesh bags I keep throughout the winter. This is also the time I will pull a few of my best heads out for next years planting. 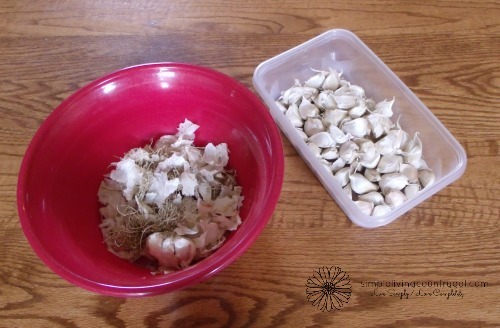 Just store your seed garlic in an open brown bag until you are ready to plant. I usually keep about 10 heads in my pantry and store them in bags for better air circulation. The garlic lasts easily a couple of months. For the rest of the garlic, I like to can it in a boiling vinegar solution. I store it in my refrigerator and use as needed. This works really well and the garlic will last up to a year this way. When ready to use, just give it a quick rinse to remove the vinegar. And no, the vinegar does not soak into the garlic. I was afraid it would when I first tried it, but there was no vinegar taste at all. 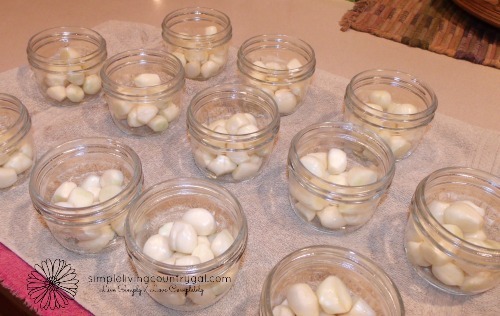 You can find my post on Preserve your own Garlic here for more detailed instructions. And there you go, 10 super easy steps to growing garlic. There is nothing more satisfying than eating fresh produce from your garden year round. Garlic by far is one of my favorites. Thank you for such an easy to understand article on growing garlic ! Wow! This is great information! 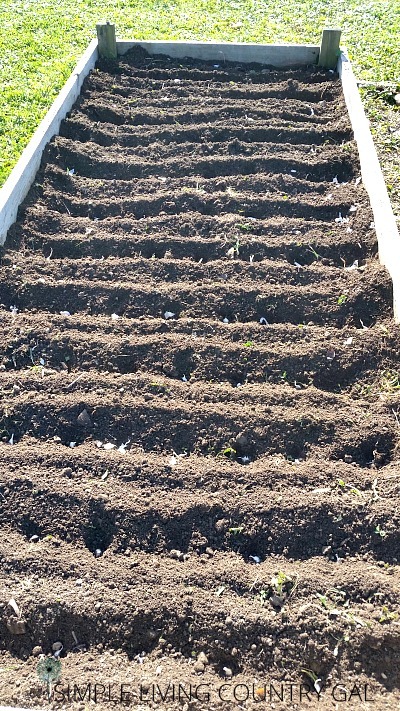 I just planted my first garlic this year! I didn’t know you could can it like that! That is great to know! Thank you for sharing at the Our Simple Homestead Hop 🙂 I’m pinning this to read again next year! I am so glad you found the information helpful. I have been canning my garlic that way for 3 years and it has been working great! Just remember to keep it in the fridge :). I just love having garlic ready to use from my garden year round, I know you will love it too! thank you for the explanation on how to grow your eyes, I have done this only without the protection over it. Thanks for joining us at Simple Homestead Hop! Last year was my first time growing garlic, and it is so easy and so satisfying! Everyone should plant at least a little garlic, don’t you think? Shared and pinned to spread the word! I just planted my garlic about a week ago, so your article is very timely. Thank you for all the great tips! I look forward to making some garlic powder. I love garlic, and it’s a special treat to make some homemade bread and slather it with garlic. Yum! I’m glad I saw your link on the blog hop! I have never tried making garlic powder, I will definitely have to look that up! Thanks for ways on planting garlic . 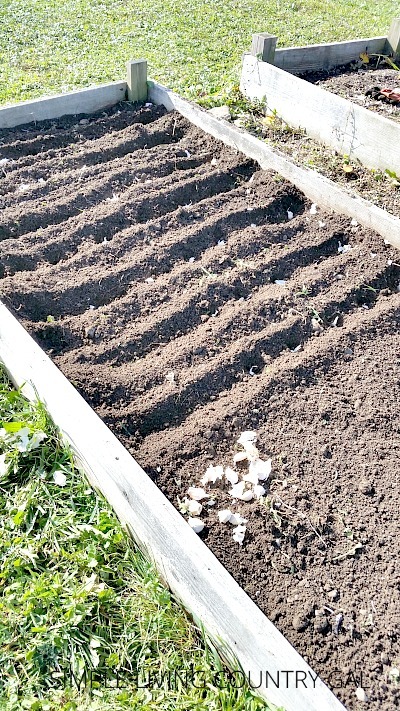 I am eager to follow for new guides on how to be successful on garlic gardening. .its fun and exciting activity in home. . Yes, garlic is by far my favorite thing to plant and grow! Hello – I notice you don’t mention removing the flower head in the spring…do you remove it or not? Thanks. Hoping to plant today! Yes, I do remove the flower (or scapes) in the spring. I know some do not, however, I have found by removing the scapes the plant’s energy goes into the bulb making it bigger and helping it to mature faster. I will add that to my post, thanks for reminding me! Don’t waste the scaps. They are good in salads and stews. Is the vinegar from the canning safe to use for salad dressings? I have been searching for a very precise and detailed method to grow garlic! You’re article nailed it!! I can’t wait to grow for the first time!! You’re amazing!! Hi, Tracy! Super detailed tips. I was wondering if you ever tried using the vinegar soak solution in salad dressing (homemade)? It should have some residual garlic flavor but might need additional vinegar for backup acid power. Anyhow- a thought 😉 Love the post. Thanks for sharing! I am glad you included storing instructions to!